At the start of 2016 Thong Nai Pan Yai welcomed back Pingchan Resort. The resort had been wiped out by a particularly bad storm in the early 2000s. It has taken a long time, but eventually, they have managed to build a new resort where the old one used to be. Pingchan Beach Resort is located next to Pen's Bungalows. It stretches south and goes in front of the Great Escape Chalets. The most noticeable thing about the new resort is that it has opted to use its beach front not just for its restaurant, but also its bungalows. So far there are 2 rows of bungalows running parallel to Thong Nai Pan Yai beach. The front row has literally direct access to the beach. Guests don't have to walk through the resort to get to the beach. It is right there, to be enjoyed from the bungalow balcony. Only Rasananda in Noi offers the same level of beach access. There is something wondrous about having an unimpeded view of the beach; and being able to lie on the beach just in front of your bungalow. The sign on the resort reads 'Pingchan Beach Resort'. However, the internet listing on Agoda has the place called 'Pingchan Koh Phangan Villas Beach Resort'. To add to the confusion, Trip Advisor has named the place 'Pingchan Beachfront Resort'. Well a rose by any other name. The resort has yet to be finished. So far there is a beachfront pool and a reception and restaurant building. From the look of things there are plans for a poolside restaurant or bar. Considering the high accommodation prices, it is likely that there will also be a Pingchan spa at some point. Those who can remember the old Pingchan's will remember their bar on the beach. It was a popular, laid back bar that sometimes hosted parties. We imagine the new Pingchan Resort will show the same resolve to provide good customer service and to entertain and engage with customers. The new bungalows look great. They are all brand new and have no wear and tear. This means these are some of the cleanest and nicest bungalows on Yai. They all come with air-con, hot water bathroom, cable TV, mini bar, safety deposit box and tea and coffee making facilities. The bungalows are made of wood and have tiled floors inside and glass in the windows. 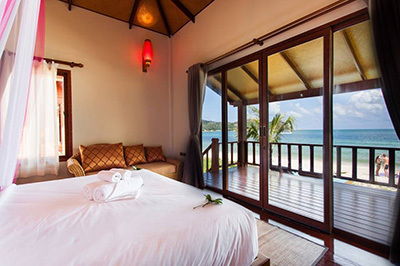 While preserving the look of traditional Koh Phangan bungalows Pingchan are providing plenty of luxury. Families will be interested in the double bungalows for rent. They are two bungalows adjoining and linked by a connecting door. The one half has a double bed for the parents and the other side has twin beds for the kids. Each side also has its own bathroom. One of the family bungalows is on the beach. Prices for bungalow rental at Pingchan Beach Resort start at 3,800 Thai Baht a night. This is a very new resort; they haven't published their low season or peak season prices yet. So expect discounts and promotional prices over the coming months. Also expect more bungalows to appear at Pingchan Beach Resort, along with more facilities and amenities. It should be mentioned they have built a low sea wall in front of the resort to prevent it being washed away in the event of another freak storm. It is good to see that the lessons of the past are being heeded.